Probably one of the most versatile handpieces on the market, the Kavo 642B is compact and powerful. Compatible with the 465 LRN or 1390 Multiflex couplers, the Kavo 642B is flexible enough for a wide range of procedures and easily portable between operatories. Both compatible couplers have integral anti-retraction valves which help prevent cross contamination, and both have water spray adjustment to ensure proper atomization of spray for excellent cooling. Kavo produces the best auto chuck available, which easily withstands the rigors of daily use and heat sterilization. Keep them clean and lubricated (without over lubricating), and Kavo turbines have unmatched longevity. Speed averages around 410,000 RPM @33 psi which provides good power without the noise encountered with many competitors. The Kavo 642B incorporates the auto regulator valve to ensure pressure to turbine is maintained consistent regardless of unit pressure. This adds convenience when other handpieces being powered from the same unit require higher pressures to operate. Many times, slow speeds take a little more pressure to operate at maximum efficiency. While Kavo recommends factory servicing, the turbines can be replaced by the user without too much trouble. Just remember to clean interior of handpiece, and replace the provided o-rings to ensure turbine remains sealed and well seated within the handpiece head. 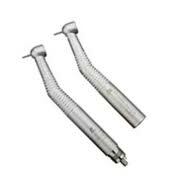 You'll also need keep track of the back cap wrench included with new handpiece purchase, or obtain one from your dealer if handpiece is purchased used. back of handpiece to the tip of a standard 19 mm bur (interocclusal clearance) - 21.75 mm. 6 month warranty on new handpiece purchase.